Did you know that maintaining a healthy mouth directly correlates to a healthy body? Many patients work hard to maintain their health by eating nutritious foods, drinking more water, and exercising. If you neglect your oral health, your overall health could still be affected. Yes, it’s very important to keep fit with a balanced diet and physical activity, but so is a great dental hygiene routine—including visiting your dentist in San Antonio every six months. 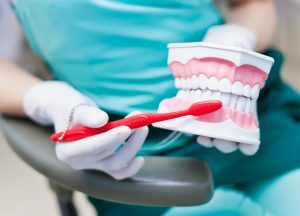 To get the most out of your brushing routine in between your appointments, here are 4 questions from your San Antonio dentist. 1. Are you using the best toothbrush? Little do most patients know, they might not be using the best toothbrush for their teeth and gums. Your toothbrush should have soft bristles. Soft bristles are able to reach into the crevices of your teeth and still be gentle on your gums. When selecting your dental tools, choose a toothbrush that appeals to you, whether that be because of its color or shape. Make sure that it fits both your hand and your mouth comfortably. 2. Are you brushing too roughly? The goal of brushing is to remove plaque, acid, and other dental debris from your smile. It’s still important to be gentle to your mouth while doing so. Brushing abrasively can cause damage to your enamel or inflammation to your gums. The same issues can occur if you brush too often. Brushing twice a day is good, even three times is great! But if you brush more frequently than that, you could cause your teeth and gums to become damaged from frequent scrubbing. 3. Are you brushing your teeth the correct way? When you brush your teeth in the morning and before bed, use these techniques. Keep in mind that you’re trying to reach all areas of your mouth—the roof, your tongue, along your gum line, and on the outsides and insides of your teeth. Pay attention to your molars (lots of food gets stuck on and between them) and concentrate on reaching those hard to reach places even in the back of your mouth. Areas that aren’t brushed correctly allow dangerous bacteria to build up and could cause decay, or even worse—tooth loss! 4. Are you using the right toothpaste? Everyone has different dental issues. The products we use can help us improve them. Depending on the weak spots in your smile and your dental goals, you may need a specialized toothpaste. New Image Dentistry can help you decide which toothpaste can help you reach your smile goals. Whatever brand you decide to go with, make sure that it has a seal from the American Dental Association (ADA) on the package. Get a Professional Cleaning from New Image Dentistry Every 6 Months! Even when you follow all of these great brushing tips, it’s important to visit your preventive dentist in San Antonio at New Image Dentistry. Our dental team works with you to keep your mouth in tip top shape! Has it been just about 6 months since your last appointment? Contact our office to schedule your next appointment.